Beautifully engraved Gold Bond certificate from the Cairo and Norfolk Railroad Company issued in 1908. 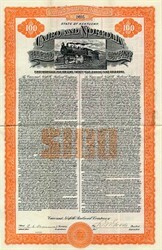 This historic document was printed by Collins Press and has an ornate border around it with a vignette of steam locomotive pulling passenger cars with a steamboat in the background. This item is hand signed by the Company's President ( L. M. Goode ) and Secretary ( E. S. Beaumont ) and is over 104 years old. The certificate is written in both French and English.